Timur Siraziev, Channel One Russia's chief UK correspondent, had an 'Official-Sensitive' 'Security Risk' alert issued against him and his cameraman, effective at all military bases across the UK. Siraziev's 'crime'? Filming a report outside a British Army facility. 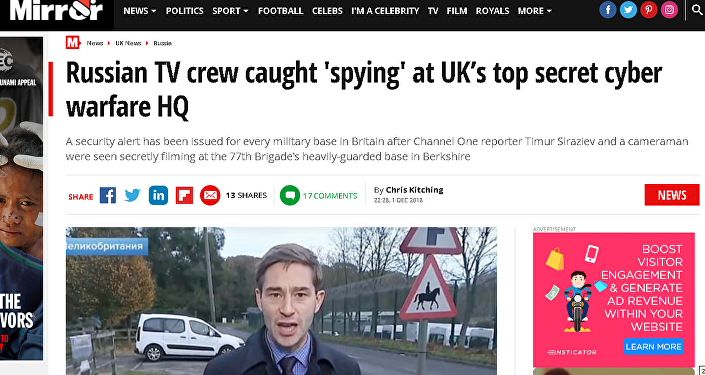 The Daily Mail, which broke the story, posted a screenshot of a secret alert, which explained that Siraziev and his cameraman had been spotted filming outside the barracks of 77th Brigade in Hermitage, Berkshire, about 50 km west of London on November 21 for a story about the British Army's psychological warfare program. "timur_siraziev: I am a journalist, not a spy! Today the British media are writing about us. Writing lies! I'm making a story on it. Details in the news on Channel One." According to the alert, the two men "attempted to gain entry, presenting themselves as members of the Russian media, claiming to be from 'Channel One Russia' and making follow-up enquiries on 'an article in the press'. No access was granted and they were turned away. One of the occupants provided his details." The alert, which includes a photo of Siraziev's press pass, as well as his vehicle and licence plate details, urges personnel not to engage in any one-on-one "contact or conversation" with the journalist, and to contact local civilian police "ASAP" "should this individual or vehicle attend any Army establishment." The alert's choice of language is odd, especially the phrase "presenting themselves as members of the Russian media," given that Siraziev is a well-known Russian correspondent in the UK, has extensively covered Brexit and the Salisbury incident, and appears in pretty much all of Channel One Russia's UK stories. In other words, all Siraziev had to do to have the 'Security Risk' warning issued against him was to a) be Russian, and b) legally film outside a UK military facility and make a completely ordinary request for comment. The UK media spun things a bit differently, reporting on the story as if the military had just caught a real-life Russian spy in the act. 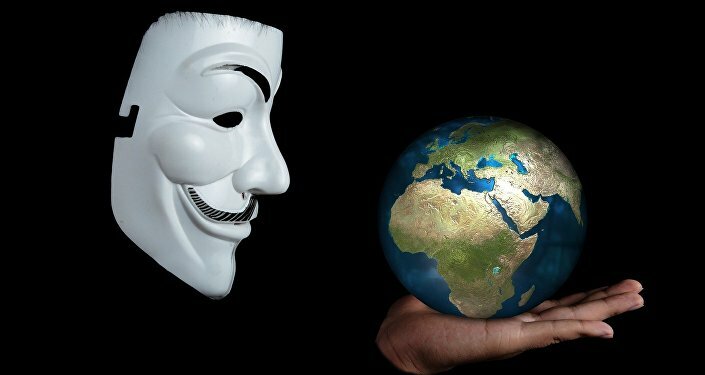 The Daily Mail sensationally accused Siraziev and his cameraman of being a pair of "Fake News team TV spies," with the Mirror claiming the pair were "caught 'spying'" at the UK's "top secret cyber warfare HQ". 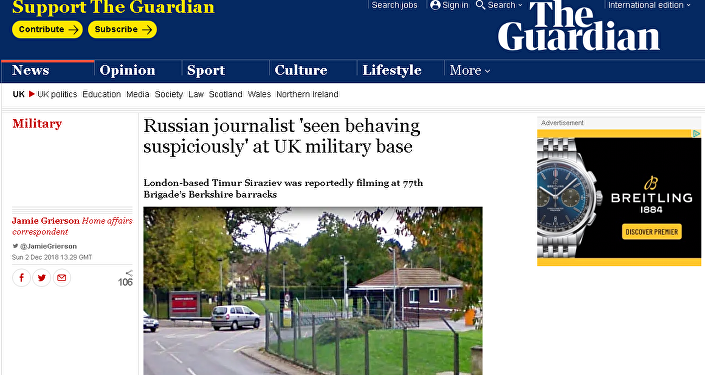 The Guardian and The Telegraph did only slightly better, with their reports claiming that Siraziev and his cameraman had "behaved suspiciously" outside the base. The story seemed important enough for Defence Secretary Gavin Williamson to give an official comment. 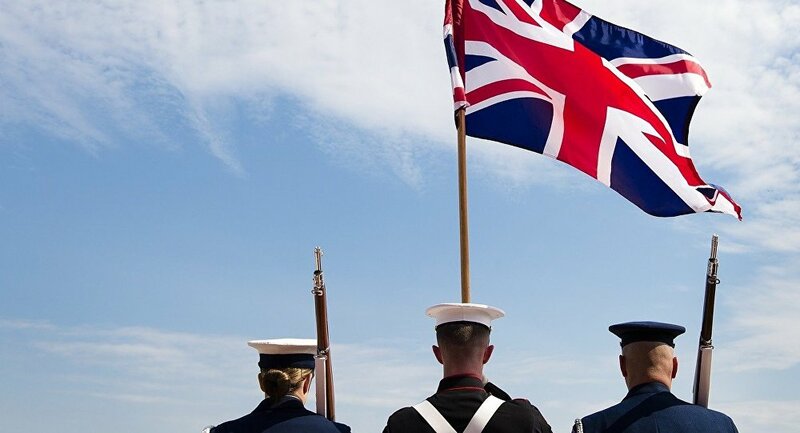 Stressing that the defence ministry "takes the security of our bases and personnel incredibly seriously," Williamson urged the public to report any suspicious activity "in or around a military base" "as a matter of urgency". The Russian Embassy in London dismissed the Daily Mail's claims as "baseless", but noted that the allegations "cannot but be of concern to us", given that they are made against the Russian media carrying out its journalistic activities "without violating any of the UK's laws, something which, by the way, cannot always be said about the activities of British journalists in Russia, who are often ready to violate Russian laws." The Embassy added that the Siraziev case was part of a broader campaign by UK authorities "to create constant obstacles" for the Russian media, with reporters complaining about problems obtaining visas, the closure of accounts in British banks, constant quibbling by various regulators, etc. Siraziev: "I'm Going to Continue Doing My Job"
Sputnik reached out to Siraziev for a comment. The journalist explained that British media had put together a completely flawed account of his work preparing the story about the 77th Brigade. According to the journalist, what he did was neither illegal nor secret, nor did he attempt to illicitly enter the base, as implied by media reports. Commenting on the Daily Mail piece specifically, Siraziev said that "what is presented in the article is not quite right, or should I say not right at all. Because they write that the journalists were trying to penetrate the base. This is not true at all; we did not 'penetrate' anywhere." "I came up to the checkpoint, introduced myself, said that I was Timur Siraziev, a journalist for Channel One, and that I would like to talk to someone. Before that, I wrote to the Defence Ministry's press service, but they didn't respond. The soldier at the checkpoint took a picture of my ID, and said he wouldn't say anything. My cameraman was sitting in the car at the time. Then I got in the car; another soldier approached, and took a photo of our car," the journalist recalled. Siraziev stressed that he and his cameraman hadn't filmed anything 'secret' outside the base. In fact, he said, calling the 77th Brigade barracks "secret" is really stretching the truth. "Wired magazine indicated the county where the 77th Brigade is based; the base is listed in Wikipedia; finding the [base] was really easy; we didn't need to do any sort of investigation. In other words, we simply took an article from Wired, translated it into Russian, and took some comments," the journalist said. The Wired story Siraziev was following up on, which led him to be listed a 'Security Risk' by the British military. Ultimately, Siraziev said he was annoyed by the "unprofessionalism" shown by the Daily Mail in publishing his personal details, including his car's licence plate number and press ID. The journalist has reported on this breach of privacy both to his employers and to Russia's embassy in the UK. "If the situation has any further developments, I will report on it, and will take some steps only if there are some sort of consequences. Otherwise, I'm simply going to continue doing my job," Siraziev emphasised.